In the new study, led by Jani Kotakoski, the University of Vienna researchers used the advanced scanning transmission electron microscope Nion UltraSTEM100 to measure isotopes in nanometer-sized areas of a graphene sample. 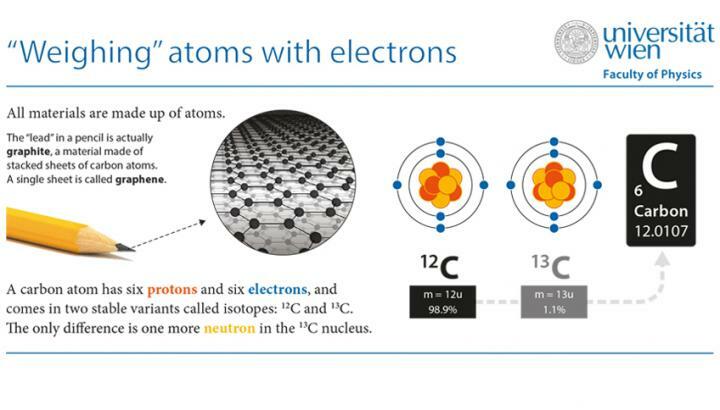 The same energetic electrons that form an image of the graphene structure can also eject one atom at a time due to scattering at a carbon nucleus. Because of the greater mass of the 13C isotope, an electron can give a 12C atom a slightly harder kick, knocking it out more easily. How many electrons are on average required gives an estimate of the local isotope concentration. "The key to making this work was combining accurate experiments with an improved theoretical model of the process", says Toma Susi, the lead author of the study. Publishing in Nature Communications allowed the team to fully embrace open science. In addition to releasing the peer review reports alongside the article, a comprehensive description of the methods and analyses is included. However, the researchers went one step further and uploaded their microscopy data onto the open repository figshare. Anyone with an Internet connection can thus freely access, use and cite the gigabytes of high-quality images. Toma Susi continues: "To our knowledge, this is the first time electron microscopy data have been openly shared at this scale." The results show that atomic-resolution electron microscopes can distinguish between different isotopes of carbon. Although the method was now demonstrated only for graphene, it can in principle be extended for other two-dimensional materials, and the researchers have a patent pending on this invention. "Modern microscopes already allow us to resolve all atomic distances in solids and to see which chemical elements compose them. Now we can add isotopes to the list", Jani Kotakoski concludes. Funding from the Austrian Science Fund (FWF), the Wiener Wissenschafts-, Forschungs- und Technologiefonds (WWTF), and the European Research Council (ERC) directly contributed to enabling the research. Publication in Nature Communications: Isotope analysis in the transmission electron microscope: Toma Susi, Christoph Hofer, Giacomo Argentero, Gregor T. Leuthner, Timothy J. Pennycook, Clemens Mangler, Jannik C. Meyer & Jani Kotakoski. Nature Communications | 7:13040 | DOI: 10.1038/ncomms13040.